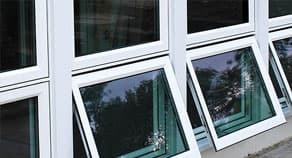 There are many types of windows to choose from when selecting replacement windows for your home. It is important to be well-informed, so you can make the right decision and choose the type of window that will be most beneficial for your home. Awning and casement windows are popular choices, and while they are similar, there is a difference between the two. Either type of cranking window is a great addition to any home and is available with many options to create the perfect custom window for your home. 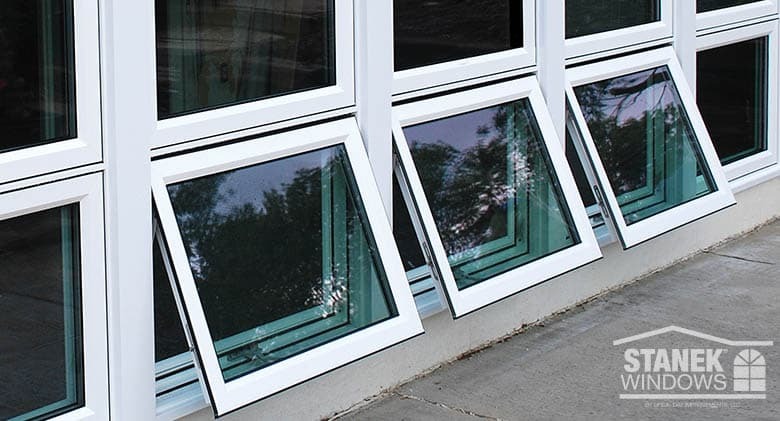 Awning and casement windows are commonly referred to as crank windows, since they are opened using a cranking mechanism. The two window types easily glide open or shut by turning an easy-to-reach fold-down handle. Both are very similar in style, but have two distinct differences. Casement windows are hinged at the side and open outward, to the left or to the right. They are available in one, two, three, four or five-lite configurations. 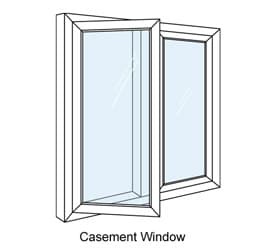 Casement windows are made for openings in which the height is greater than the width. However, awning windows are hinged at the top and are only available in one, two or three-lite configurations. 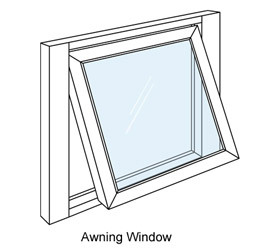 Awning windows are made for openings in which the width is greater than the height. Since awning and casement windows open outward fully, they provide maximum ventilation and natural light. They work well in places where ventilation is required, such as in a bathroom or kitchen and are also commonly used in a sitting room, where unobstructed views are desired. This style of window requires a fair amount of free space around it to allow it to open fully. Trees, shrubs and other obstructions should be located away from the outside of the window. Crank windows do not have any rails or meeting sashes, providing a spectacular, unobstructed view of the outdoors. They are also very easy to open and are ideal for hard-to-reach spaces. The space above your kitchen sink is the perfect place for an awning or casement window, because it allows for easy access to open and close the window effortlessly. Awning and casement windows have great ventilation capabilities. They’re structural strength allows for larger window sizes and can provide an abundance of air and natural light. Stanek® awning and casement windows are manufactured with 1-1/8-inch thick insulated glass for maximum energy efficiency and home comfort. Our fold–down handles are easily turned and allow for smooth, easy opening and closing for the life of your window, without interfering with window treatments. Unique window design and a 90-degree open angle facilitate easy exterior cleaning from the comfort and safety of your home. Secure your windows at two, three or four points (depending on size) with one easy-to-operate handle, with our multi-point cam locking system. 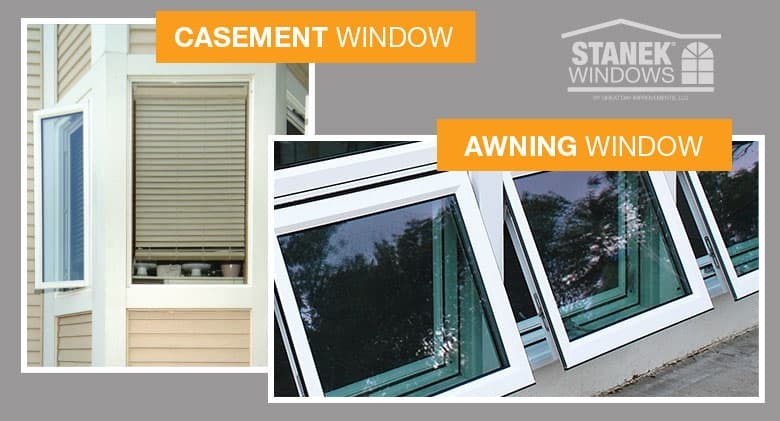 Whether you choose casement or awning windows for your home, you’ll be able to customize your windows with an abundance of options from Stanek® Windows. Design a window to fit the architecture of your home as well as your design style. Stanek® Windows are available in double- or triple-pane energy-efficient glass. Create the perfect window for your home and add custom details like privacy glass, safety glass and custom-etched patterns. BetterVue™ screens are strong and durable. They offer improved visibility, airflow and superior insect protection when compared to standard mesh screens. Choose from four rich woodgrain interior finishes. Enjoy the look of real wood without the maintenance. Stanek® windows are available in six standard interior colors, which include four woodgrain finish options. There are eight standard exterior colors, but offer unlimited custom exterior colors. All we need is a swatch to match! Add character with our between-the-glass window grids, also called window grilles. Enhance the aesthetics of your windows with one of our two grid shapes; flat or contoured. Our casement and awning windows fold-down handle and lever lock come in white, beige, brown, bright brass, antique brass and satin nickel. Leave a distinct impression on your guests with a sophisticated window and elegant hardware. Both awning and casement windows are excellent choices when it comes to installing windows in your home. Depending on your preferences and needs, either window will be a great custom addition to your home. Are Stanek® awning or casement windows the right choice for your home? Contact us today and schedule a free, in-home consultation to find out!